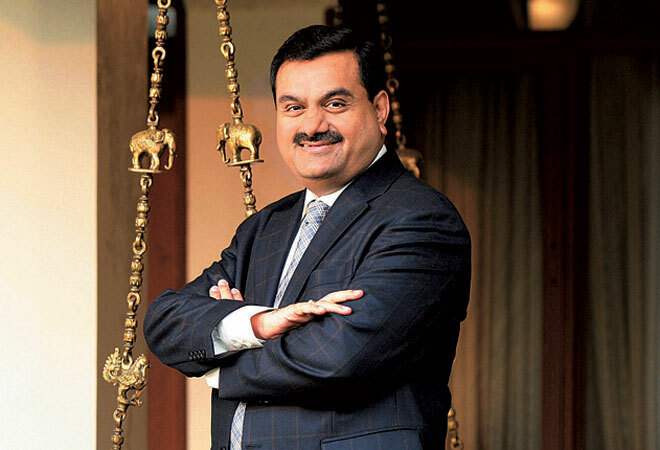 Why Gautam Adani is making a bet on Australian coal and how the odds are stacked. As you enter the 25th floor of the imposing 10 Eagle Street building on Brisbane’s Golden Triangle business district, there is little to suggest that this is the nerve centre of one of the biggest projects ever undertaken by an Indian business house and the most globally controversial one as well, in terms of both environmental impact and economic viability. Though it is mid-morning, the foyer and the corridors look empty from the outside except for a back-lit logo that just says ‘adani’. You have to ring a bell for a receptionist to appear and press a button to unlock the glass doors. Once inside, there are two things you notice – one, a panoramic view of the Brisbane river and the city down below and, to your right, a large picture on the wall, an aerial view of what must a be a port with a very long snout, or trestle. The picture carries no description, but it doesn’t need to: it is the biggest single bet Gautam Adani has ever made – the Abbot Point port terminal in Queensland, about 980 km north of Brisbane, which he bought for nearly $2 billion in 2011. Another $1 billion has gone into the Carmichael mine in the remote Galilee Basin, about 400 km inland from Abbot Point, half of it for buying the rights to it in 2010, and the rest for drilling and exploration since then. Over the next three years, Adani will need to invest at least another $7 billion – half, $3.5 billion or so, to get the mine up and ready for first coal; and the rest to build a brand new railway line to Abbot Point and to construct another terminal there to handle the full volume of 60 million tonnes of coal a year that the mine will produce once the ramp-up is complete by 2022.This is a vertical integration play with a vengeance – Adani will mine the coal in Galilee Basin, transport it on his own railway line to a port in Abbot Point that he owns, and then ship it to his own Indian port from where it will be taken to his own power plants. Two-thirds of the Carmichael coal, or about 40 million tonnes a year, is meant for India, with about half of that intended for Adani’s own plants. According to ABC Radio, Australia has never seen anything like this, and neither has India. When the mine is fully ramped up, it will be the biggest in Australia by far (twice the size of the next biggest), and also one of the largest in the world. Even more important, as the pioneering venture in the Galilee Basin, Adani’s project is likely to have a multiplier effect. The rail and port infrastructure he builds will probably bring to life five other proposed megamines in the Galilee Basin belonging to companies such as India’s GVK and China’s Macmines, with a combined capacity to produce 272 million tonnes of coal a year. In fact, the viability of the Adani infrastructure projects depends crucially on these other projects taking off, so that they can either share the cost of the build-up, or pay for its services. In effect, Adani’s moves will open up the entire Galilee Basin for exploitation – a 250,000 square kilometre area, slightly bigger than the United Kingdom – that is estimated to hold over 27 billion tonnes of coal in all. And there lies both the strength and the weakness of Adani’s Galilee Basin gamble. 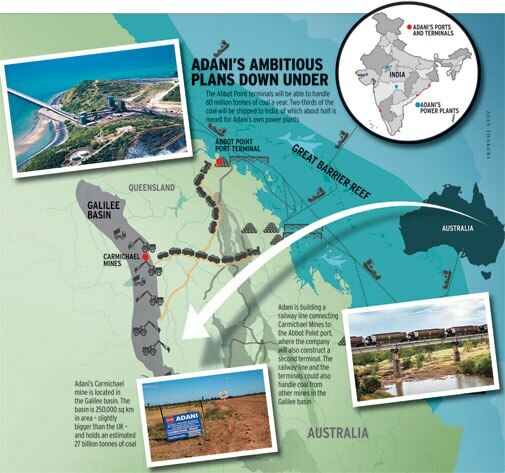 On the one hand, it is the scale of this possibility that is making both the Australian federal government and the Queensland state government bend over backwards to please Adani – even going to the extent of promising hundreds of millions of dollars in equity for his proposed rail line to Abbot Point, or offering a royalty holiday for the first project to come up in the Galilee Basin. On the other hand, it is precisely the scale of this possibility that is making the global environment movement see red, and join hands to stop the project dead in its tracks. According to the Green Institute of Australia, the lifetime carbon dioxide emissions of the coal mined in the Galilee Basin would be, conservatively, 24.7 billion tonnes, and that is about five per cent of the carbon budget available for the whole world between 2010 and 2050, if we are to restrict global temperature increase to within 2 degree Celsius. The environmentalists so far have had some remarkable successes. They have run a sustained global campaign against Adani’s Abbot Point port expansion plans, which involve dredging and dumping around 3 million cubic metres of spoil in the Great Barrier Reef World Heritage Area. 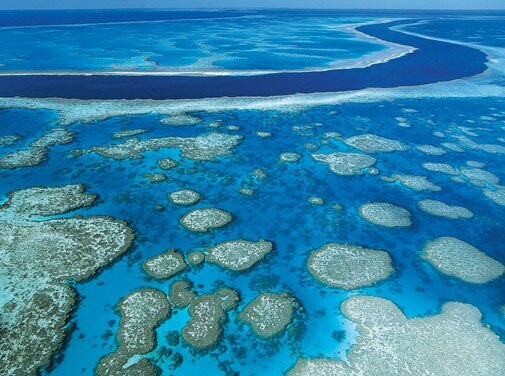 (The Great Barrier Reef itself is just an hour or two away from Abbot Point by boat). Under the threat of UNESCO putting the Great Barrier Reef on the endangered list, the Australian government was forced to reverse the permission it had given to dump the spoil in the sea, and recommend that it be dumped on the Caley Valley wetland instead, at an additional cost, by some accounts, of hundreds of millions of dollars.The campaigners have also been successful in forcing many global banks and investment houses – including Citigroup, Goldman Sachs, Deutsche Bank, JP Morgan Chase, Royal Bank of Scotland, HSBC and Barclays – to publicly declare that they would not fund any development in a world heritage area, neither would they degrade a critical natural habit. Adani officials say these statements are too generic and of no consequence, but the mere fact that the banks have been forced to publicly respond at all, should cause them some concern. Right now the campaigners are focused on getting similar statements from the most likely financiers of Adani – Australia’s four biggest banks – Westpac, NAB, ANZ and CommBank. There are social media campaigns, on-the-ground events and even face-to-face branch-by-branch visits that are on, to shame the banks and their officials into declaring that they will not fund anything that threatens the Reef. But for Adani, an even bigger enemy than the environmental activists are market forces. After a decade that saw coal prices more than triple to over $140 a tonne, they are now in the dumps, at just over $67 a tonne, and Adani’s is one of the very few mining companies still making big coal investments. Most are making quick exits. For example, four months ago, mining heavyweight Rio Tinto sold a Mozambique coal mine it had bought for over $3 billion for just $50 million – and the Indian public sector consortium ICVL that bought it is yet to find a way to make money, because coal prices today do not cover its cash cost of production! Opinion is divided on where exactly the prices are headed. There are those who say that prices during the early years of this decade were an aberration and one is not likely to see them again because coal is now entering a phase of structural demand decline. Europe’s coal consumption has been declining rapidly and, by 2020, it is expected to be 26 per cent lower than what it is today; the US is set to follow, and even China’s scorching consumption growth is now considered a thing of the past as the country adjusts its growth rate downwards, reduces the energy-intensity of its GDP, and adopts policies that reduce pollution and increase power plant efficiency. In the view of coal sceptics, coal has always traded around the $30-40 a tonne mark and the crazy period started in 2003 and ended in 2011. But there are others who argue that what we are witnessing is merely a cyclical downturn and coal will be king again, as India and other developing countries ramp up power production even as China moderates its consumption growth. Which of these scenarios plays out will determine whether Adani’s gamble will pay off. If coal price doesn’t move up significantly, the Galilee Basin projects in general would find it difficult to get financial backers and even if Adani pushes through the Carmichael project somehow, with its high infrastructure investments in rail lines and ports, it could fail. But on the other hand, if prices were to move up and the Galilee Basin projects come online, viability may no longer be a question mark, though the additional supply itself could cap the price rise and put some pressure on margins. 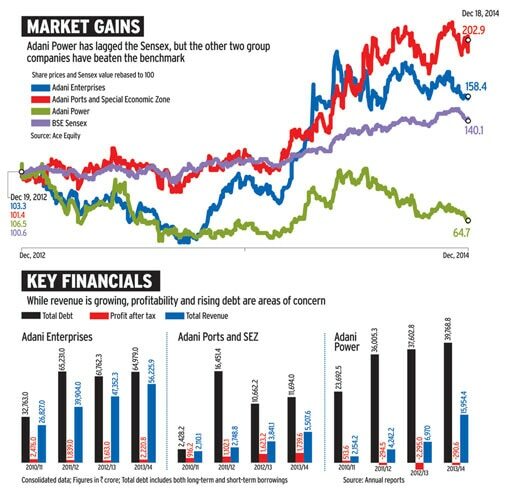 Adani Power has lagged the Sensex, but the other two group companies have beaten the benchmark. While revenue is growing, profitability and rising debt are areas of concern. He sums up his challenge this way: “A lot of talk has happened about Galilee Basin. We do not want to talk. We want to make progress, slow and steady, and de-risk the overall business model. Our business model is not just the mine, but the entire value chain. How to optimise the value chain and minimise the capital expenditure in terms of capex ratio on mining and infrastructure; how to get third parties in; how to spur this whole growth in Galilee Basin? The government’s thought process and our thought process are completely aligned. A lot of people will come. The question is who will come in first.” Momentum, and the popular perception that the project is indeed moving ahead, is most critical for Adani – and that explains why he wanted a high-impact public announcement of the $1 billion loan from SBI, and the funnelling of money into the rail project by the Queensland government, during the G20 summit in Brisbane. On a sunny November day in Airlie beach in the achingly beautiful Whitsundays region, which calls itself the “Heart of the Reef”, there is anger and frustration at the way the right-wing Queensland government has been pushing the Adani project through. Their concern mostly is the danger the port expansions at Abbot Point and elsewhere in the region pose to the health of the reef, to the quality of the water surrounding the Whitsunday islands, and to tourism which, apart from sugar, is the mainstay of the region. According to the latest report of the Great Barrier Reef Marine Park Authority published in 2014, “the overall outlook for the Great Barrier Reef is poor, has worsened since 2009 [when the previous report came out] and is expected to further deteriorate in the future. Greater reductions of all threats at all levels? are required to prevent the projected declines in the Great Barrier Reef and to improve its capacity to recover.” So any additional perceived threat is something that draws global attention and ire. Anyone who has ever been to the Great Barrier Reef (a short two-hour boat ride away from Airlie Beach) cannot but be awed by the delicate wonder of probably the most spectacular ecosystem in the world. Airlie Beach is 100 km south of Abbot Point, and the people know that Adani’s Carmichael project is just the front end of a rather long train coming their way, carrying coal. Once this project is through, there will be five more coming up in the Galilee Basin, all looking to take out their coal through ports in the region. Kirsten Grace, one of the organisers of the Whitsunday Residents Against Dumping, says their concerns over Abbot Point persist, even after the decision to dump the dredge spoil on wetland rather than at sea. “We know what happened at Gladstone (another nearby port) a few years ago, where a bund wall that was built to keep the dredge spoil away from the sea leaked and killed off the entire fishing industry there. They are talking about doing the same thing here. We are in a cyclone zone, and you are dumping it on wetland, which is part of the ecosystem of marine life in the region!” Sandra Williams, another resident who is part of the movement, questions the original decision of the Great Barrier Reef Marine Park Authority to allow dumping in the sea, against the advice of most of its scientists. The Australian Broadcasting Corporation even did a long documentary on how the decision process within the Authority was vitiated, with the concerns of marine scientists being brushed aside. Al Grundy, a tourism operator in the region, says there has been a serious decline in water quality in the region, and the developments along the coast are partly to blame. The Adani group has been smart enough to sense this difference in outlook, and build on it. 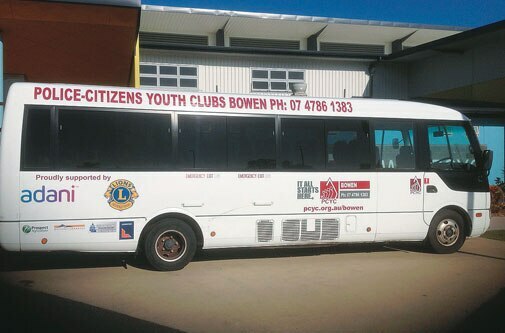 Over the last few months, it has been running television ads in local channels; holding public meetings at Bowen with Captain Sandeep Mehta, CEO of Adani Ports & SEZ, taking questions; and even sponsoring gleaming new buses for the “Police-Citizens Youth Clubs” of Bowen.Jobs are indeed the reason that politicians cite for supporting the project, but the numbers don’t hold up, say locals who are opposed to it. By Adani’s own early estimates, the Carmichael mine project will generate only about 8,500 direct jobs in all – 3,500 of them permanent positions, and 5,000 construction jobs that will last only as long as it takes to build the mine and the infrastructure around it. By contrast, tourism in the region generates 65,000 direct jobs, while bringing in $6 billion in annual revenue. In other words, the employment intensity of mining is so low as to be inconsequential, according to those opposed to the projects. To top it all, say the activists, the Australian government has recently relaxed requirements for what is called the 457 visa, under which companies can bring in workers from abroad. 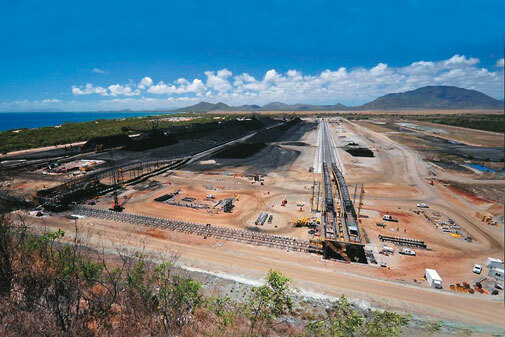 Adani has already appointed Korean company POSCO as its procurement and construction contractor for the rail project, and the residents believe that it is likely to bring in Korean workers. Even mining jobs are not a certainty for locals, with companies increasingly adopting “fly-in, fly-out” methods to organise work. What this means is that companies fly in workers from major cities such as Brisbane, who work 10 to 12-hour shifts for a fortnight or so in the mines while staying in one-bedroom camps with common facilities set up by the companies close to the mines, and then they go back to the cities and their families for rest and recuperation, before the cycle starts again. This reduces costs for the companies, who no longer have the hassle of developing entire townships with hospitals, schools etcetera, to attract workers and their families. However, this creates havoc in the family life of miners and hollows out the mining towns, say critics.What gives the local opponents of the mining projects greater visibility and impact is the way they have used social media, and also the way they have plugged into global and national movements fighting against fossil fuels, climate change, and threats to wildlife and world heritage. From World Wildlife Fund to Greenpeace to the Rainforest Action Network to the Institute for Energy Economics and Financial Analysis (IEEFA) and the Australian Marine Conservation Society, they have been able to knit together a strong platform from which to take on three governments (Australian federal government, Indian central government and Queensland provincial government), a range of mining interests, and also some of the biggest global financial conglomerates. 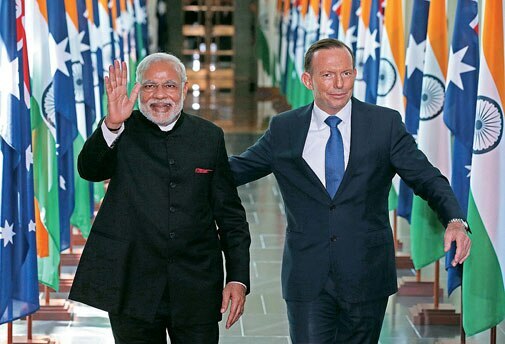 Many of them came together at the World Parks Conference in Sydney’s Olympic Park on the evening of November 17, at the same time as Prime Minister Narendra Modi was addressing a massive gathering of non-resident Indians at a stadium just a stone’s throw away. The day had begun badly for the group gathered under the common banner “Fight for the Reef”. There was a frisson of disappointment coursing through the gathering, when the news of the Queensland government deciding to channel hundreds of millions of dollars into the rail project of Adani reached them. And also, of course, that of SBI deciding to sign the MoU for the $1 billion dollar loan to the mine project. They had all been focused on making the Galilee Basin projects unfundable for both economic and environmental reasons, and now these two decisions suddenly moved that goal post farther away. Coal prices have almost halved since touching a high in early 2011. While the Adani group was busy winning financial support from the Queensland government for its project, it had to face a googly from a very unlikely quarter: the Indian government. On November 12, the Union Minister of State for Power and Coal, Piyush Goyal, made a statement that was remarkable for its ambition. In remarks made during the India Economic Summit in New Delhi, he said, “Possibly in the next two or three years, we should be able to stop imports of thermal coal.” The reason, according to him, is that the government is determined to more than double the output of the public sector Coal India to 1 billion tonnes by 2019. If this were indeed to pass, the Galilee Basin coal projects would be dead in the water, because without India as a major international buyer of coal, prices would have little chance of recovery and no amount of financial support from Queensland government would be able to make them fly. But can the Indian government actually step up coal production at that rate, adding 100 million additional tonnes a year, for five years? It may not be impossible – as it seems to be – for two reasons. One, India does have the coal deposits to increase production to that extent. Second, even bigger feats have been achieved elsewhere – between 2000 and 2012, China increased its production by about 200 million tonnes every year, taking the total up from 1.5 billion tonnes to 4 billion tonnes. So would India be able to do at least half as much? No, if you go by the assumptions underpinning the Adani project. The group believes that India’s coal imports are poised to shoot up to at least 300 million tonnes a year from 126 million tonnes last year, as it steps up its power generation. Either Goyal or Adani is wrong, but we won’t know who, for a while yet. But if the Goyal statement was bad news, more heartening vibes were to come from another quarter soon enough: The IEA, the organisation that does long-range demand and supply projections for everything related to energy. In its latest Energy Outlook report released in November, the IEA made its projections for coal under three scenarios of differing climate change and emissions policies. The first is called the Current Policies scenario, which takes into account only those policies and implementing measures that had been formally adopted by countries by mid-2014. The New Policies scenario, by contrast, takes into account also those policies that have been announced, but not yet formally adopted. The third, 450 scenario, takes an outcome-based approach, in the sense that it takes into account policies that will be necessary if the rise in long-term average global temperature is to be limited to 2 degrees Celsius. As can be expected, the demand for, and the price of coal varies wildly under these scenarios. In fact, coal is subject to far greater price risk than either oil or gas, due to its emission intensity. According to the IEA, the demand could vary from 7,098 million tonnes under the Current Policies scenario, to 2,907 million tonnes under the 450 Scenario by 2040. But it treats the New Policies as the most likely scenario, and under that, the price it projects for coal in 2020 is this: over $100 a tonne. By 2040, the price could marginally rise to about $110. If you apply a discount for the Galilee coal, the price could come down to anywhere from $70 to $90 a tonne. These projections show China’s demand plateauing in the mid-2020s and India overtaking it in 2025. They also support two conclusions: one, coal price jumps of the kind we saw in the past are history, and two, there is still growth to be had, especially in India, and that could continue to drive up prices, though at a much slower pace.So where does that leave Adani and his backers on the one hand, and all those who are dead set on stopping them, on the other? Adani’s bets are essentially four: one, that Indian demand for imported coal is about to see a dramatic growth unlike what Goyal suggests; two, that new carbon emission standards are unlikely to be in place to keep global temperature increase to below 2 degree Celsius; three, that bankers will not let environmental concerns come in the way of business decisions; and four, that global prices are about to recover and will be well on their way to $100 a tonne by the time Carmichael mines its first coal by the end of 2017. The die is cast – and may the better cause win!